MILWAUKEE, WI — On the front of the Astor Theater building, VAUDEVILLE, ASTOR THEATER & VAUDEVILLE just went up in ft high gold letters and trim matching the 1915 prints. 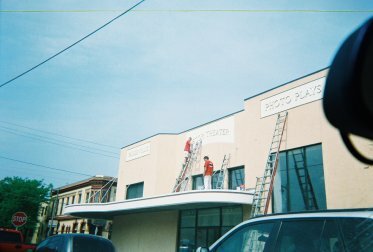 Part of the theater is still used: film, post production editing, live theater and music. The signage worked! I am in Milwaukee for the THSA conclave now and had walked up to the neighborhood for dinner and the “Vaudeville” lettering caught my eye; I walked over to take pictures and ended up looking through the facility (wow, a pharmacy, restaurant, and theater in one? how unique! ), making a purchase, and chatting with the pharmacist.